Impressions of a Reader...: Meeting a Friend, NYC, Dinner and Books! This post is late! I had a crazed, long working week and wasn't able to put up my posts last week, but better late than never... right? Last Tuesday evening I finally had the opportunity of meeting in person one of my oldest on-line friends, and wasn't that just the best treat?! Indigene (Indie Reviews) and I met on-line in 2007 and since then have been trading book recommendations and conducting our own, and often lengthy, in-depth book discussions through emails. Well, Indie finally came all the way from Ottawa, Canada to New York City and of course we had to meet each other in person, even if it was for one day or one evening. 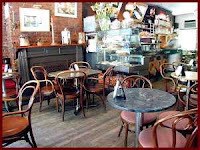 We met at the Port Authority and took a taxi to one of my favorite little places in the West Village, La Lanterna Caffe on McDougal. I love that little place because of its atmosphere, service, food, good wine, great coffee and desserts, but the best feature is that you can sit there all night and they won't bother you or throw you out! LOL! It's a good thing too, because Indie and I sat there from around 5:45 p.m. to around 10:30 p.m. talking, discussing books, talking and just.... talking. Let me tell you, those hours were not enough! We share a mutual love of history, politics, literature and the LGBT genre, and it was wonderful to be able to discuss in person the books and authors whose works we love. And how about the fact that it felt as if we had known each other forever? We just picked up where we left off on those emails... how great was that?! Of course we brought each other a little "hello, it's nice to meet you" present, and guess what it was? Not much of a guess when it comes to book bloggers, right? Indie gifted me with two unique Canadian surprises: a delicious bottle of Maple Syrup -- my husband was licking his chops before I got through the door, lol! And I was ecstatic when I unwrapped one of Indie's favorite books, a novel I've been wanting to read ever since she reviewed it for Three Dollar Bill Reviews, The Summer Between by Canadian author Andrew Binks. Here it is! On the ‘wide, slow river’ in front of his home, twelve-year-old Dougaldo Montmigny navigates the dark waters of homophobia and racism while realizing his parents’ disintegrating relationship and the complexity of his own feelings for a summertime playmate. 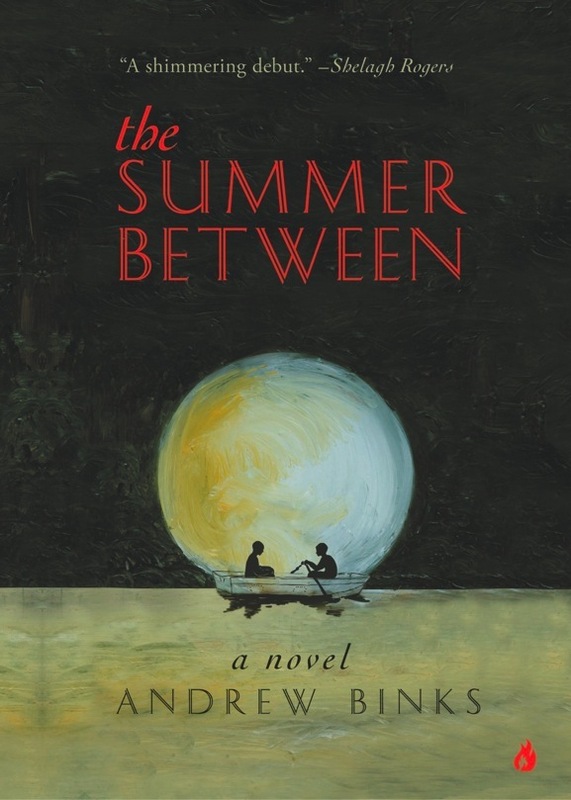 Dougaldo’s transitional ‘summer between’ is a lesson on love, desire, and innocence lost. In turn, I gifted her with two of my favorite books. The first was a book I simply loved and wish everyone would read! 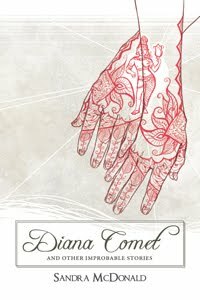 My 2010 LGBT Speculative Fiction top pick and Lambda 2010 finalist under their SF/Fantasy/Horror Category, Diana Comet and Other Improbable Stories by Sandra McDonald. The second book was another 2010 release, but one I read and loved this year, The Perfect Family by Kathryn Shay. I'm hoping Indie enjoys these books as much as I did. Oh, it looks like you had a great time!! I'm so glad for you! What a heart warming post, Hilcia. Truly. I'm so glad that you two finally met and had such a lovely time together. Thank you so much for this write up of our get together. I am so, so happy we had the opportunity to meet in person, miss you already and can't wait for our next visit. Perhaps in Canada? I read The Perfect Family and thoroughly enjoyed it and am saving Diana Comet to read when I know there will no interruptions. Unfortunately, I'm back to reality today and off to work. Indie, I'm so glad you enjoyed The Perfect Family, already?! Thank you again for everything. It was a wonderful evening and a pleasure. It's always so wonderful to meet our fellow bloggers, isn't it? And you're right - it's almost always like you've met a billion times before. YAH for meeting online friends. One day I'm going to make it to NY, and as well as catching up with old friends I am looking forward to meeting my online friends for the first time! Hello! Your post was so sweet, I'm envious, I'd like to meet some people I've come to "know" from the net, like you lol :), but an ocean is a bit too long a distance to cross. I hope the memories of that day last forever!! Its always fun meeting online friends. I'm glad you guys had a good time and good stuff on all the books!! Thank you Mr. Binks! I hope to do so. :) This book means a lot to me.